We make available PP Socket Fusion Pipe Molded End Caps in different mm dimensions in order to met varied requirements of the industries. We are one of the nonpareil Manufacturers and Suppliers of PP Socket Fusion Pipe Molded End Caps. The best thing about our PP Socket Fusion Pipe Molded End Caps is that it is manufactured in accordance with DIN 16962 standards. 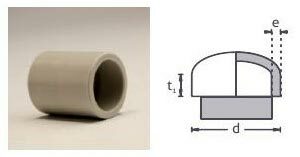 Customers can obtain PP Socket Fusion Pipe Molded End Caps from us in both retail and bulk quantities.